Paul Kagame holds the key to peace in DRC? 1994 genocide suspects fled into DRC and until they are eliminated, Kagame will do everything including destabilising Kinshasa. The agreement signed between the DRC government and the M23 rebels looks good in the press but obscures an insidious fact. Among the many analysts on the DRC conflict, I am among those convinced that any peaceful settlement should and must guarantee the security of DRC’s neighbours, particularly Rwanda. Looking at how the past agreements have panned out so far leaves a kind of unsettling , if not eerie, feeling about the new deal. This is my reasoning. Mobutu was overthrown by Paul Kagame funded rebels. International Relations and International Security theorists do not agree on many aspects of the international system, especially on the salient causes of war. Since the birth of the DRC it has been plagued by the scourge of war that over the years roped in its neighbours culminating in the so-called first and second African War in 1996 and 1998 respectively. Theories on this subject provide two explanations, all based on state or possibly individual self interest. One is that the neighbours seek security on their borders – something the DRC state has failed to offer on account of the plethora of armed groups that run swathes if its territory – and the other emphasises on economic opportunism – the allure of easy minerals in the DRC that propels erstwhile good neighbours into avaricious war mongers. I subscribe to the former school of thought without necessarily discounting the latter’s premise and I will use Rwanda to demonstrate the point. Few lack the knowledge of the 1994 Rwanda Genocide – yes, before you roll your eyes, any attempt to understand Rwanda’s actions in DRC is inexorably linked to the genocide. This blood bath took place amid a gruelling civil war between Rwandan Government Forces (RGF) and the rebel group Rwanda Patriotic Front (RPF). A peace agreement (Arusha Accord) had been jettisoned and the players were gearing themselves up for a decisive battle. Not even the ill-equipped UNAMIR (you can read all about that in Lt.Gen(rtd) Romeo Dalliare’s Shaking hands with the Devil) could provide the moral and actual force to stop the war. Rwanda has the right to defend itself from losing a single life. 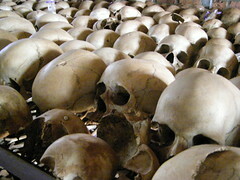 One million died in 1994 Rwanda Genocide.Trouble is that Kagame is facilitating killings in DRC so as to protect Rwanda. In the end however, there was no proper vanquishing of the losers, instead the RGF escaped into Congo along with elements of the interahamwe group. No security screening was and these forces escaped into Congo with heavy artillery and other military installations. It is key to note that these two groups (RGF and interahamwe) form the critical mass of the FDLR rebel group in Congo. The new government in Kigali had a problem. The problem – in my view – began with its security. How could it sustain its hold on power while the enemy was taunting it across the border? Worse still, how could the new Rwandan government guarantee its security while the rebel group, which it had vanquished in similar circumstances as the latter was employing now, was enjoying free rein on the other side of the border owing to the unstable government of Mobutu Sseseko? It is through these lenses that I see Rwanda’s involvement in the ousting of Mobutu and the subsequent engagement in the fight against Kabila (Snr) as Rwanda had hoped that the latter would rein in on the rebel groups that posed a threat to Rwanda. This brings us to the birth of M23. You would recall a rebel group called RCD fighting in the second DRC war. This is the group that splintered into M23 on the basis that the DRC government was not keeping its end of the bargain. However, looking at the agreement, provides fodder to the security thesis of Rwanda’s involvement. There were no concrete steps to stem the threat of hostile armed groups in Congo. The fact that Kabila even trained and armed them, particularly the FDLR and interahamwe provided the spark for the second Congo war. No government would sit back, wait and watch as enemy forces become strong enough to oppose its rule. Peace keeping mission to DRC is a real nightmare. Owing to the tricky nature of international politics especially with the advent of international legal institutions, indirect military engagement was and is Rwanda’s best shot and maintaining its security outside an enforceable inclusive agreement. Thus the use of RCD and M23 by Rwanda forces to ensure that the FDLR pose no significant threat to its security.Perhaps we may yet see the cropping up of other similar groups to fill in the void so long as FDLR is still active. In conclusion, the intractable situation in Congo can never be made better by ignoring the security of riparian states. It is foolhardy to ignore such a sensitive issue and exclusively cling on to the notion that it is pure avarice that drives Rwanda to engage in Congo. At one point 12 African countries were fighting in DRC repelling Rwanda’s efforts at overthrowing Kabila (senior). It may be true, as it was of the Taylor regime in Liberia, that some elements in the Rwandan government are using the war as a smoke screen for mineral wealth, however if the security threat in Congo is fixed once and for all – through the strengthening of political and legal institutions in eastern Congo – then I believe that Rwanda will stay away from Congo. If not, then I think we would witness the birth of other armed insurgent groups under the auspices of Rwanda. Paul Kagame accused of hunting down political opponents? BBC faces the boot for criticising Mr Rwanda? Posted on 30th December 2013 by newsafrica. This entry was posted in Africa, African Security, DRC, Leadership, Paul Kagame, Rwanda. Bookmark the permalink. website to much bigger audience and make it go viral.